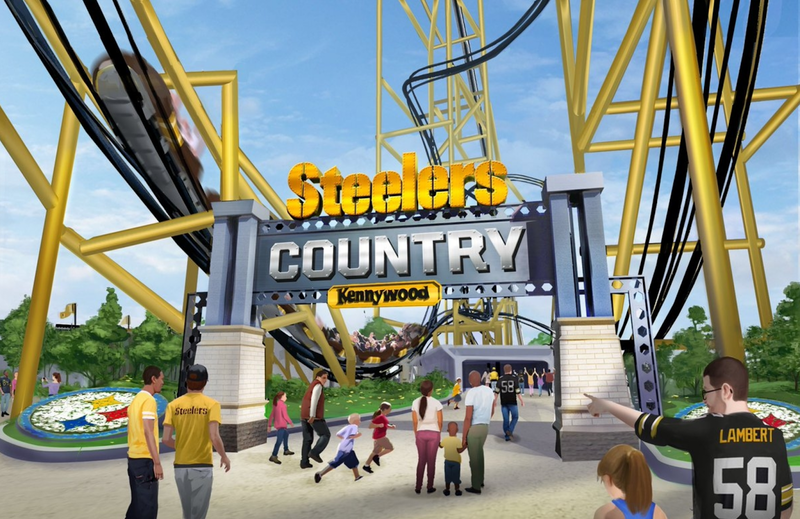 Today was Kennywood's highly anticipated announcement of the amusement park's 2019 plans, and not only did the park reveal a massive new steel roller coaster, but also a brand new section of the park themed to the Pittsburgh Steelers football franchise. 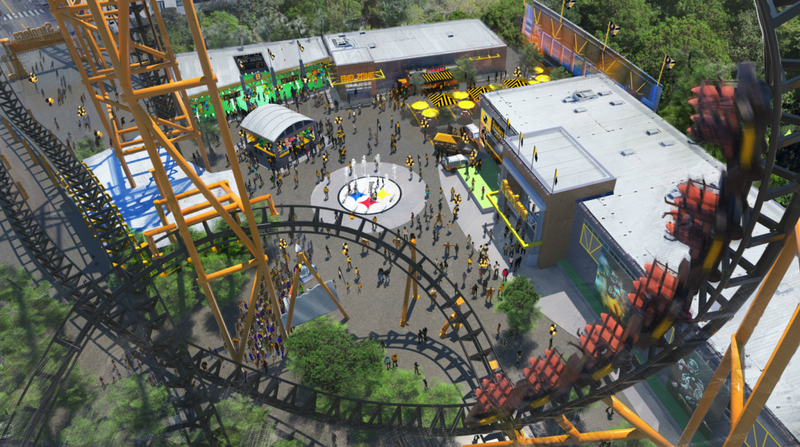 Kennywood and the Steelers have teamed up to create a one-of-a-kind area that is "unprecedented in both the sports and amusement worlds." 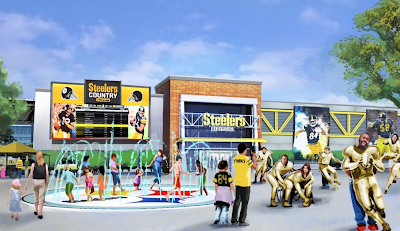 Known as Steelers Country, the area will bring to life the feeling of game day, complete with "exclusive merchandise, skill games and food locations including a themed tailgating experience." Steelers Country will reside on the land that was formerly home to the park's log flume, Log Jammer, and make full use of the space. 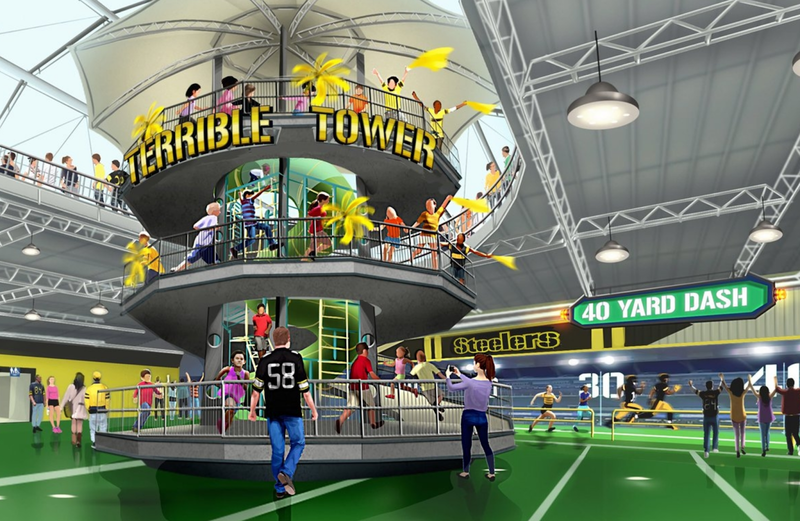 It will be the perfect location for Steelers fans, featuring several different activities, games and more - including the Steelers Experience, seen above. This area is described as a "one-of-a-kind indoor, multi-level training facility that puts you on the field and in the center of the action." 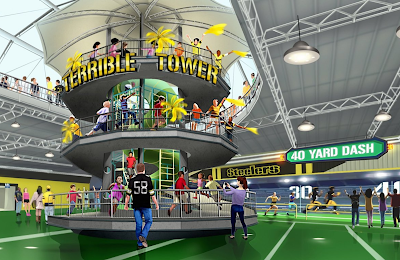 The Steelers Experience will feature interactive attractions such as the Terrible Tower, seen above, a 40 yard dash and a competitive 2-minute drill. Other activities include perfecting touchdown dances, and following live games on the area's giant video screen. Steelers Country will also feature plenty of new Steelers themed midway games, along with the End Zone Cafe, an indoor restaurant, and the Tailgate Patio which mimics the experience of tailgating at the Steelers stadium. 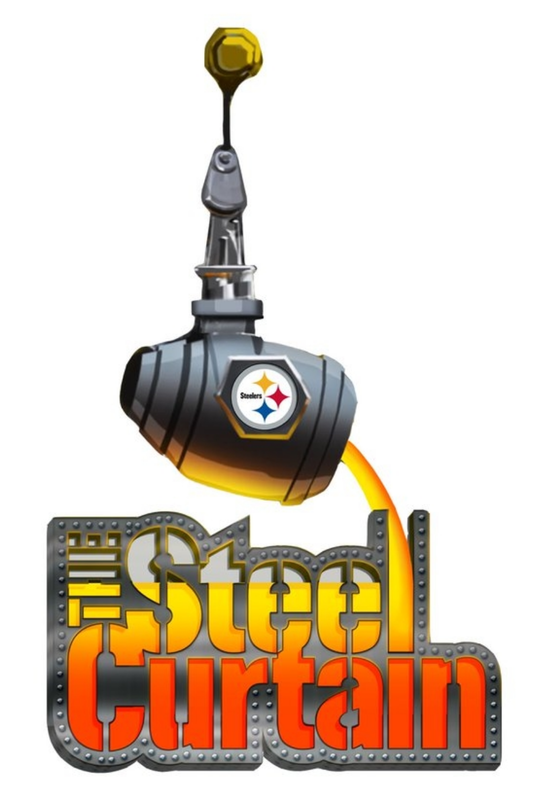 Anchoring the new area is a massive, unique and in many ways unprecedented roller coaster named The Steel Curtain... which refers to the Steelers directly in its name. 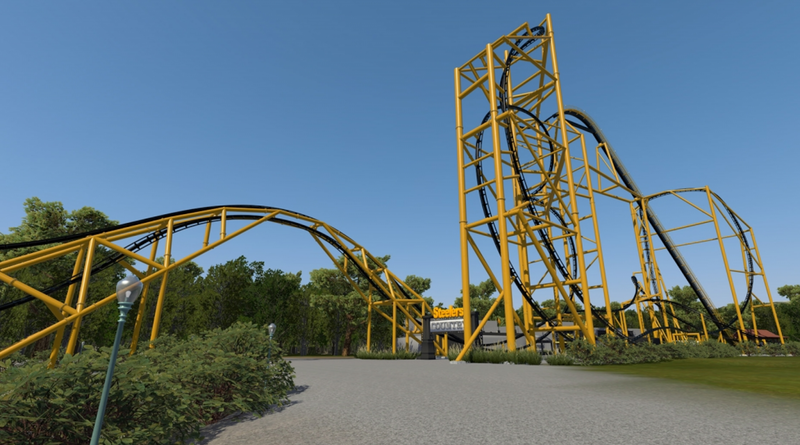 Designed by S&S Worldwide, Steel Curtain will stand 220 feet tall, making it the tallest roller coaster in Pennsylvania. 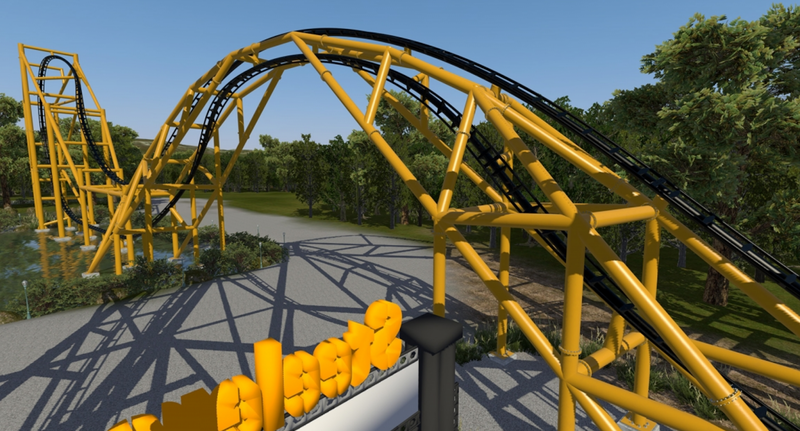 The coaster will feature bright yellow supports with black track, Steelers colors, naturally. Just take a look at this art featuring the entire ride layout and let it sink in... we haven't seen many rides quite this unique or massive go up in the United States in recent years. After the 220 foot tall lift hill, which is at a steep 50 degrees, there is a small dip before a corkscrew element that takes place 197 feet in the air - a world record for highest inversion. The trains then continue to roll and face back toward the lift and drop the rest of the way toward the ground. 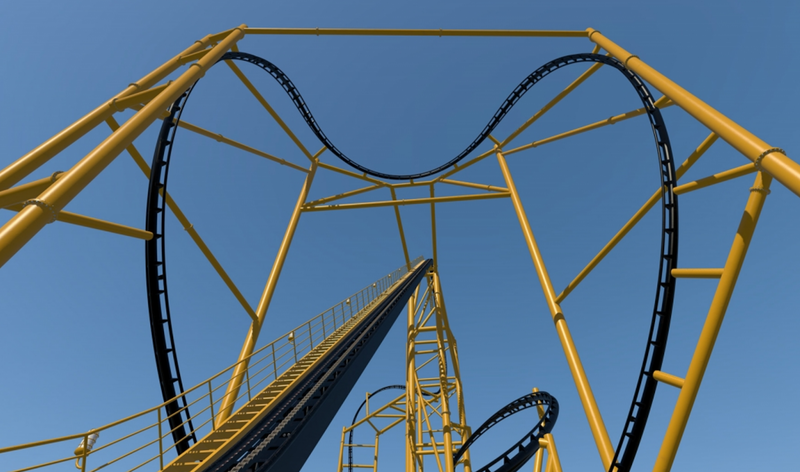 The trains hit the top speed of 75 miles per hour and take a high banked curve to the left before climbing into this element, which is like a cobra roll but only gigantic and keeps trains more horizontal to the ground mid-element than a traditional cobra roll. Flying back across the layout the trains swoops up and into an elevated pair of corkscrews, or also kind of a high-exit Immelmann and dive loop put together - think of the first element on a Vekoma SLC as an example. Next the train leaves the Steelers Country area and does a large air-time hill over the park's midway, then climbs up into a twist-and-dive element located directly over the park's central lagoon. The trains cross back over the midway via a 180 degree stall element tucked under the air-time hill. After another air-time hill, there is an extended corkscrew that leads into a downward into a ground hugging helix, with one more cutback/stall element left before a hop up onto the final brakes. 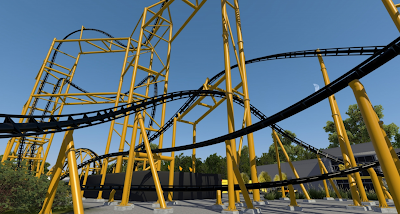 Steel Curtain will feature 9 inversions, which is the most on any coaster in the United States, and the 2 minute long ride will cover 4,000 feet of track. The trains will feature 24 riders at a time. I'm fairly sure that my descriptions still leave a lot of the imagination as to Steel Curtain's layout, so thankfully the park released this point of view animation to clear up any lingering questions you have. 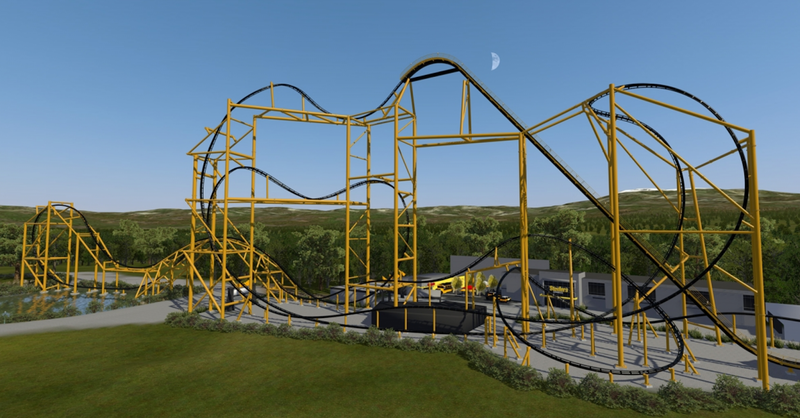 Congratulations to Kennywood on announcing such a massive project, this coaster alone would be a massive investment for the park, let alone a new themed area too! I can't wait to see this coaster go up! 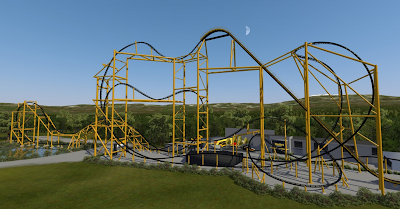 Be sure to check out Kennywood's page for the expansion here for more photos and information.